Grace Holland and her work 'Through the Lens'. Ruby Evans and her 'Make-up Girls'. Andrew Churchill and James Hiller - sweet Jac Yvonne sounds for Opening Night. 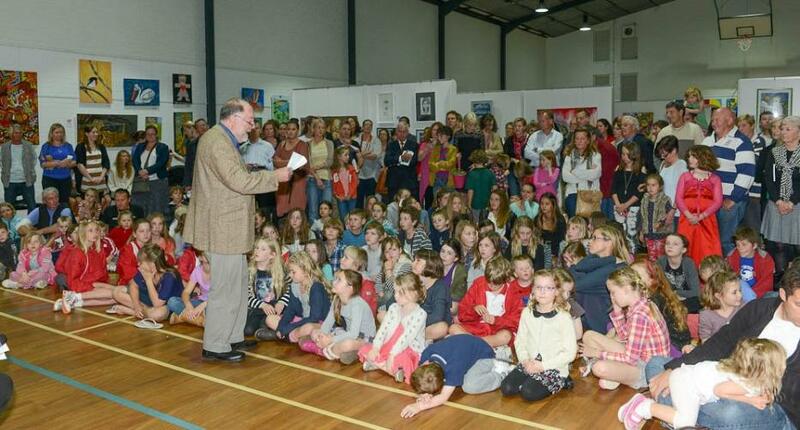 Pittwater Artfest, now in its 7th biannual year, had 360 entries for this year’s exhibition in the main hall of Avalon Recreation Centre. ArtFest is a free community event celebrating our area and the artistic pursuits of the children who live here. On Friday night, 21.9.2012, the opening, conducted by Mayor Harvey Rose, resonated with a well chosen stanza to resonate a key idea behind this celebration of engendering and appreciating art in all its forms from Samuel Taylor Coleridge’sKubla Kahn. The ArtFest festival encourages children to put down their digital devices, turn off televisions, get off the computer and pick up a paint brush, pencil, pen or musical instruments and create something based on the year’s theme. 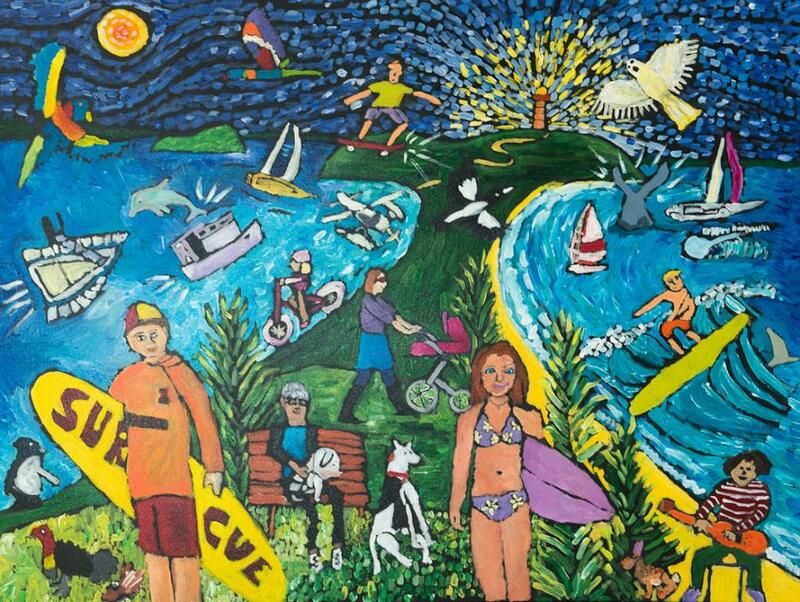 With ‘Our Community’ as their inspiration subjects as wide ranging as land and seascapes to people filled every work displayed from all schools in Pittwater and as far afield as Terrey Hills. Each child we spoke to on Friday night was clearly delighted with what they had created and had enjoyed using their own personal choices for creating something that shared a little of their perspectives on the world. Their deftness with addressing and completing these works proves Art in Pittwater and its surrounds has a very bright future. 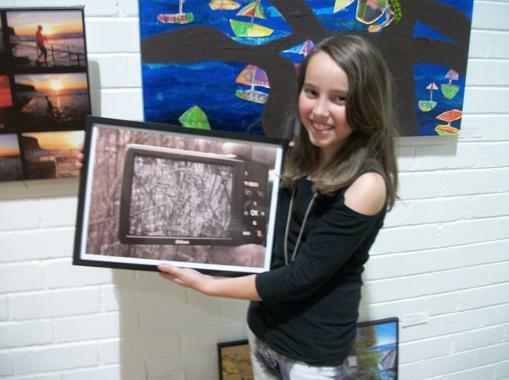 Pittwater Artfest encourages self esteem by exhibiting the work of every child that enters. 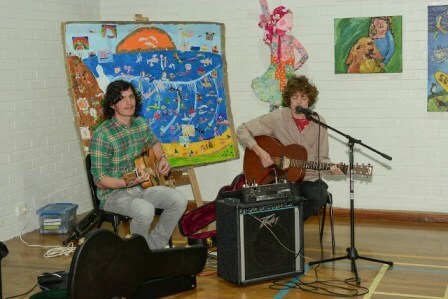 It not only encourages children but engages families and local artists to participate together in the local community. Pittwater Artfest attracts thousands of people to the area during its duration. Entrants submitted 2-D Media including Painting, Drawing, Collage, Printing, Digital Arts, Photography and Mixed media. 1. Keep making lots of artworks; all of you who have a painting here are already very talented people. The only way to get better is to keep making lots of artworks. So keep doing that. 2. Make sure you set up somewhere you can always work. It’s good to have a space to create in, to not have to pack up and set up but be able to get straight to work. 3. Mainly for older and teen artists; Get yourself a Blog page, use your Media Literacy to create a platform for your work. 4. Keep entering Art Prizes as you continue your career. Art in the Park, on Saturday 22 September was more Arts and Music activities filling Dunbar Park, Old Barrenjoey Road, Avalon. Children created ‘rock art’, turned a plain walled tee pee into something beautiful, or like Tjakura Raffan, to right, made a painting mum and dad will treasure for years. 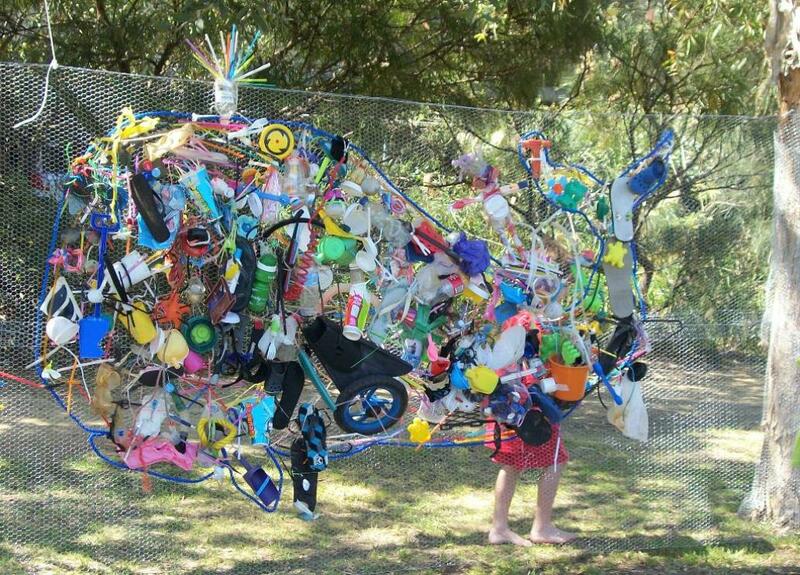 The Living Ocean team, with help from the Two Hands project in supplying just some of the plastic refuse they had gathered from our beaches, created a whale to emphasise whose home we are polluting styled on their own logo. Assisted by talented recycle artist Angela Van Boxtel will be with us also to create a fabulous whale artwork with 'Climate Girl' Parry's Raines, children had great fun creating something from what we carelessly throw away while learning about Living Ocean’s environment projects and their current ‘no plastic please’ focus. 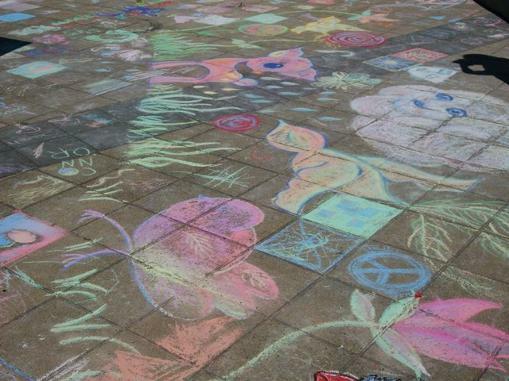 Children attending Art in The Park worked alongside professional artists paintings picture, sculpting, weaving a basket, making a puppet, throwing clay, and chalking the pavement outside the community centre until colour filled every square. 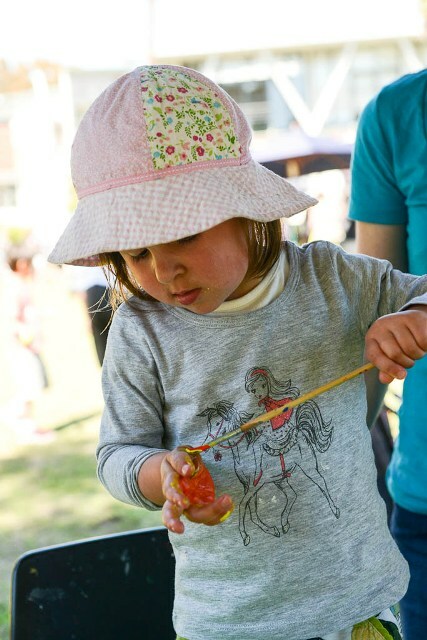 Since being initiated by local artist Meredith Rasdall in 1998, the Children’s ArtFest has run every second year and is now managed by Pittwater Community Arts ably supported by Pittwater Council. This year ArtFest was overseen by Stephanie Brown who toiled hard and long to produce a wonderful display of the children’s colourful, imaginative and highly talented artworks. Michelle Cruickshank, Karen Hick and Michelle Watts assisted Stephanie and received her heartfelt thanks on Friday evening. Attending the event were Hon. Bronwyn Bishop and Hon. Rob Stokes who praised the children’s works and handed three prizes each to children aged from pre-school to high school. Stateswoman Bronwyn Bishop like ‘Rainbow Horses’ by Isobel England, ‘Chickens In Avalon’ buy Zoe van Bruten and ‘To the Rescue’ by Christopher Cole. Our Pittwater MP chose ‘The Spotted Tree’ by Terrey Hills pre-schooler Charlie-Rose for this fine understanding of trees having spots, ‘My Family in Pittwater’ by Emma Dunstan of MVPS and ‘Jacaranda Cottage’ by Grace Fisher of Newport PS. A list of winners and those commended is to the left. Hon. Rob Stokes, Mrs Wilga Rose, Mayor Harvey Rose. 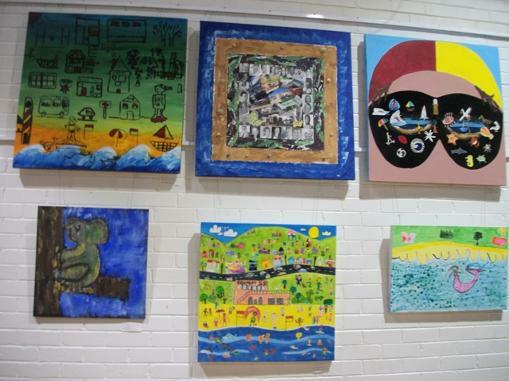 In the meantime the Exhibition will remain open at Avalon Recreation Centre until the end of Wednesday this week. Go and let your eyes be dazzled by all our children see. Khyana Shilston with Mardi Gras, Saturday. Luca Smithhard creating Rock Art. 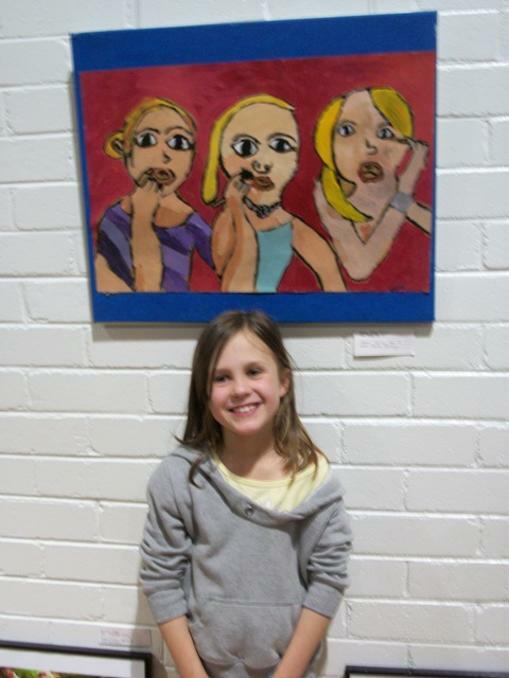 Visual Arts Group Meredith Rasdall 'Our Place' 5-12 years. Photo by Michael Mannington. Mayor Harvey Rose addresses opening night for ArtFest 2012 audience. Photo by Michael Mannington. Living Ocean's ArtFest 2012 Whaley logo created from plastic refuse. PIc by A J Guesdon.